The world of nineteen eighties loudspeakers was a weird but rarely wonderful one. Celestion’s SL6 with its clangy, first generation metal dome tweeter was considered state-of-the-art. Linn’s madcap Isobarik, with its multitude of forward facing and upward firing drivers, was thought the reference. Quad’s ESL-63 electrostatic, twenty years in the making, was regarded by many as merely quaint. And the nation’s best selling ‘speaker? KEF’s Coda – pure nineteen seventies design and engineering in a cheaper, smaller box! It was into this fray that Epos launched its ES14 in 1983. Designer and company founder Robin Marshall, who’d just done several big-selling boxes for Monitor Audio, brought a whole new way of thinking to the party. Precisely in tune with the times, it made a virtue of basic simplicity and elegant engineering. Gone were the multiple drive unit arrays, complex crossovers and big, boomy boxes. Epos called it, “a masterpiece of clear thinking and purposeful engineering”, and it was right! Intelligent simplicity was the key. It might sound like a crushingly obvious thing nowadays, but the world was still awash with seventies ‘speakers with a welter of cheap paper drive units, knitted together with unfeasibly complicated crossovers, and shoved into large, flexible boxes with a lump of cotton wool to keep the wobbles at bay! In this context, the ES14 looked ultra-modern, like a BBC Microcomputer sat next to a slide rule. As was the fashion back then, this loudspeaker was a large standmounter. Speaker stands were the new religion. Whereas just ten years earlier, people simply dumped even top-of-the-range reference designs costing thousands of pounds on the floor behind the sofa, eighties audiophile thinking dictated welded steel tubular frame stands (black, naturally), spiked to the floor rigidly. As such, the ES14 could only have been this way. At 488x226x290mm and weighing 11kg a side, it was no Wharfedale Diamond – it was big, and sounded it! A choice black ash, mahogany or walnut wood veneer – with black textured drive unit frames – gave it a crisp, modern look. Inside, one 200mm bass driver and one 26mm treble driver of Epos Acoustics’ own design and manufacture, could be found. The bass driver used a plastic cone and synthetic rubber surround, while the tweeter sported the obligatory aluminium-alloy dome. Although by today’s standards, neither of these drivers are anything special (far from it! ), the trick was the way the two integrated so well. Unlike almost every other speaker on the market at the time, there was no need for complex crossover circuitry thanks to the complimentary mechanical characteristics of the two drivers, plus of course the fact that there were ‘only’ two drivers and not three (or more)! The result was a relatively easy load to the driving amplifier by eighties standards. A sensitivity figure 87dB (poor now, but good then!) and an impedance that didn’t fall below 7 ohms (nominally, it was 8), made for an easy, unreactive load. Epos said it worked best with amplifiers rated between 25 watts and 100 watts into 8 ohms. Positioned 250-500mm from the back wall and at least 500mm from the sides on rigid floor stands, the result was a crackingly fast and articulate listen. 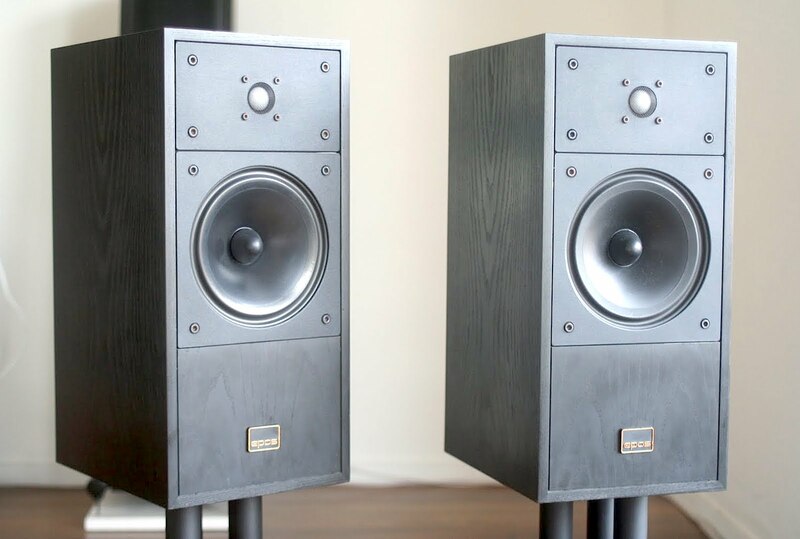 Epos ES14s combined the scale and physicality of a big speaker with the speed and delicacy of a small one. Aspirated by a good pre-power amplifier combination (Naim’s NAC42.5/160 was a popular combo), the ‘14s could pin you against a wall, yet image brilliantly and offer a wonderfully deep and spacious sound while doing so. The metal tweeter was not a smooth cloth dome design, but it wasn’t as obviously acerbic as some of the other dustbin lids found in rival boxes. The Epos was refined over the years until it was discontinued in the early nineties. Expect to pay £150-£300 depending on condition (and whether stands are included), and partner with decently smooth transistor electronics – tube amps need not apply! By today’s standards, you can certainly ‘hear the drive units’, but its intrinsic speed and musicality shines through nevertheless. It’s not the most transparent, but it still eerily engaging, reminding you that whatever the (alleged) benefits of floorstanders are, there’s little like a big standmounter in your average medium sized British listening room. I am also a fan of the es 14 but alas one of the drive units have blown. what replacement unit is there available as originals are no longer available?